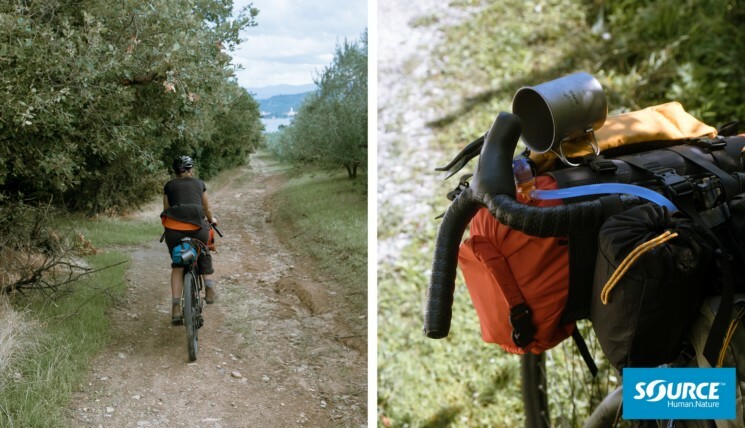 Bikepacking is a self-supported style of lightly-loaded bicycle touring. 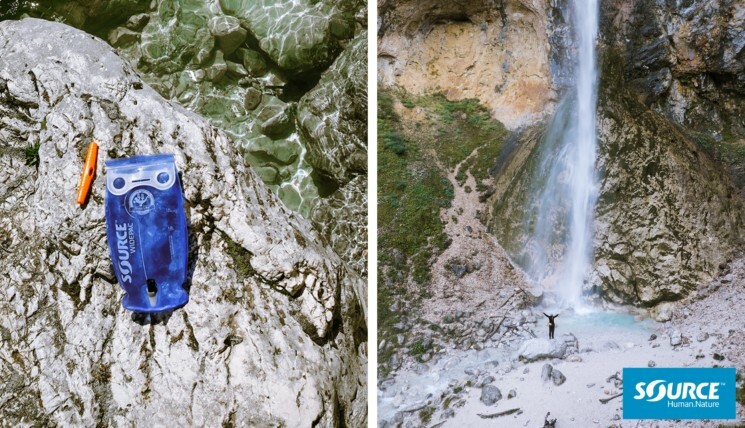 It’s about exploring landscapes and connecting with nature. 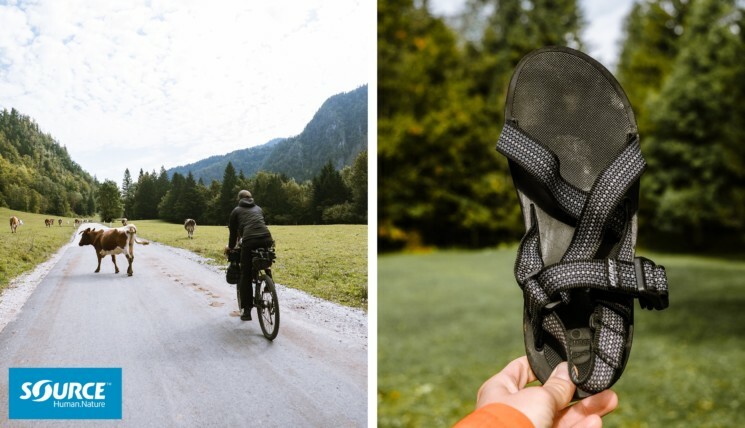 Find below the report from a memorable bikepacking trip by Neza Peterca exploring Slovenia, Eastern Europe, on bicycle supported by SOURCE with Sandals and Hydration Systems. Mid September me and my partner set on a 2 week bikepacking adventure around Slovenia, to discover hidden places, small villages and enjoy the beautiful nature of my home country. Few weeks prior to departure,Source sent me a pair of Crosser sandals and a hydration system to put it through a test, such as bikepacking trip is. When we planned the tour, it seemed a good idea to do it in beginning of Autumn, since most of the tourists would be gone and the weather would still be perfect for cycling, but it turned out to be more of an opposite. We boarded ourselves and our fully loaded 30kg bikes on the train in Budapest towards the Slovenian border, where we would start our journey. We were carrying warm clothes, 2 pairs of footwear (one of them was the Source sandals), cooking equipment, dehydrated food, camera equipment and lot’s of water storage. Gergo had 3 water bottles (1.5l all together) and I had a Source hydration system in size 2L. Now, if you look at the map of Slovenia, you can see it forms the shape of a chicken – sort of. The first few days we spent cycling “in the head” of the chicken, with Austria on our right side. I did not expect this part to be so hilly, also that we would be either descending or ascending at all … but literally there was not a single flat road. Roads between these villages had from 17% to even 21% gradient climbs and pedaling a 30kg bike up on those hills was serious mule work. Two days into our trip the weather forecast looked rather gloomy, showing low temperatures and lots of rain 7 days ahead, so we started to think about a plan-B. Even though we were prepared with rain gear and warm clothes, we were afraid of glue-like mud on the trails, sleeping in a wet tent and possibly getting sick. On day 3, the dark clouds reached us and it was like someone had opened the water pipes. It was pouring. We still decided to ride 30 km to the nearest town where we could catch a ride to the capital. The water was coming from all sides, splashing from the cars, puddles and I got additional portion splashing from Gergo’s rear tire into my face. After few kms the water made its way through our rain gear, shoes, bags and we were soaking wet. We knew that we could not continue this way much longer, so we decided to wait a few days, until the apocalyptic weather would calm down. After 2 days of waiting we got lucky and the clouds opened for a day. We used the opportunity to visit the Logar glacial valley, which is located just 60km from the capital, in a protected natural park, surrounded by the Kamnik alps. The route took us through small villages and over the Črnivec pass, descending into the narrow Savinjska valley. The temperature noticeably got lower and we were cycling in our warmest gear, we had with us, meaning no more riding with sandals, it was freezing! Due to off-season time and low temperatures we were of the very few tourists in the valley, so we could enjoy the quiet night in a mountain hut, at the far end of the valley. The rain clouds creeped back in by next morning and we found ourselves climbing the same mountain pass in a cold thick fog. The forecast showed more rain for the next 3 days, so again we decided to stay put and let it pass. After seeing our options we decided to change the original plan a bit and headed to the Slovenian seaside where we would make our way towards North-West, crossing the Julian alps and going back to central Slovenia. At this point we were fed up with waiting, fed up with rain and just wanted to continue our trip no matter what. We spent a day cycling through the Slovenian coast line, taking sections of the Parenzana route (abandoned train line turned into bike road), exploring the Strunjan Natural Park and enjoying the warm sun rays. The temperature of the sea dropped to a level which was too cold to take a dip unfortunately, so that stays on the list for next time. During the night, another cold front reached us, we woke up freezing and our tent was swimming in a muddy puddle. We didn’t want to waist time waiting for the rain to stop, so we packed out wet gear, put on the rain jackets and started cycling towards the Kras region, where we knew we would be staying in a tiny village called Štanjel, at our friend’s house. What followed in the coming hours was the hardest 6 hours of riding we ever did. We faced constant rain and heavy headwinds, which made our moving very slow and unstable. My brain was telling me to quit, my body was unwilling, but I was not alone, and together we fought it through and eventually arrived to Štanjel. We managed to dry all our gear overnight in a cosy 400-years-old house, and the new day greeted us with a sunny morning. The same day we made our way to Nova Gorica, at the Italian border, where we met our friend Dean, who joined us for next day’s etape till Kobarid, up in the Soča valley. We got up really early, so we could have a long day on the bikes. The route took us on newly built bike road along the turquoise Soča river, with amazing views on the surrounding mountains. Soon we started a long climb on the Goriško hills, where we continued through small villages enjoying the view on the Julian Alps, the Dolomites and we were even able to spot Adriatic sea. After a few hours spent on the higher altitude, we had to descend down to the bottom of the valley, where we could continue our way up to Bovec. The Soča valley is quite narrow and the Sun there disappears fast behind the mountains. We arrived to Bovec by the last beams of daylight, and quickly set up the tent in an empty camping, just outside of the village. The next morning was beautiful and sunny, so we could warm up and then start pedaling towards the Vršič mountain pass, making it up to 1611m a.s.l. in 33km. After 3 hours of climbing we finally reached the top, the Sun was already going down, temperatures dropped and we were surrounded by early Autumn snow and late tourists. The only thing waited ahead was a well deserved descend into Kranjska Gora, where we would camp for the night. After a couple hairpins, I shockingly realized that my brake pads on my disc brakes are useless, meaning, I was not able to brake at all. I was able to stop with help of my feet and a short uphill. What seemed to be a joyful ride downhill turned into a 6km hike down to the valley. Right after I arrived to the village I realized that one of my Source sandals was missing, I had carried them attached to my saddle bag, but one sneaked out, while descending on the rough cobblestone road. I was devastated, but Gergo offered to go back to try tracing them down, sadly it was getting dark fast and he was unable to find them. We had our last day ahead of us so we wanted to take it easy and enjoy the surroundings. From Kranjska Gora to Mojstrana we rode on a newly build bike road, far away from the traffic, what a joy that was to see. In Mojstrana we turned off the bike road, and continued into Radovna valley. The road was not long ago still gravel road, but now it’s paved making it for a smooth ride and again stunning views on the surrounding high mountains. We descended from the valley into the most famous Slovenian town, Bled, a lake town with a picturesque church on an island.